Average ERP estimates range from 4.9% for Taiwan to 22.1% for Iran. Weighting all 59 countries equally, the average worldwide ERP is 7.6%. Average risk-free rate estimates range from 0.3% for Japan to 12.6% for Iran. Average overall required equity return estimates range from 6.0% for Japan to 34.7% for Iran (see the chart below). Average (median) ERP estimate is 5.4% (5.2%). Average (median) risk-free rate estimate is 2.8% (2.8%). The following chart, constructed from data in the paper, summarizes average equity return (ERP plus risk-free rate) estimates in local currencies for the 59 countries with more than five responses from finance/economic professors, analysts and company managers. The order is from lowest to highest average estimated return. In summary, average local returns to equity (ERP plus risk-free rate) for 2018 based on responses to a survey of international professors, analysts and company managers range from 6.0% to 34.7% across 59 countries. 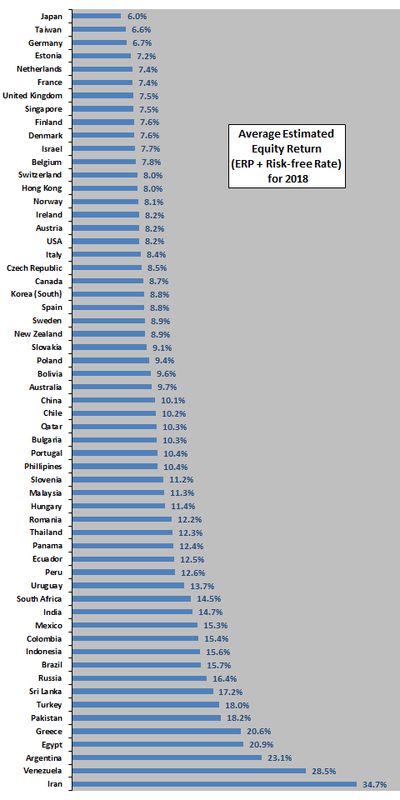 Many country sample sizes are very small for computing statistics. Only 30 (6) countries have at least 50 (100) responses. Standard deviations (uncertainties) of ERP estimates vary considerably by country. Since results are in local currencies, an investor in one country seeking equity positions in another country would need to take into account expected change in the associated exchange rate over the equity holding period. Neither the equity premium forecast nor the exchange rate forecast may be accurate.